Patience Worth was the spirit of a seventeenth-century Quaker from England who supposedly communicated with a relatively uneducated St. Louis, Missouri, housewife named Pearl Curran in the early twentieth century. Curran reported that she first began receiving messages from Worth via a Ouija board, but she later received these messages purely in her mind. 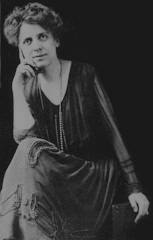 In July 1912 Pearl Curran and her friend Emily Grant Hutchings were making a call on a neighbor who had a ouija board and during that call there came what purported to be a message from a relative of Mrs. Hutchings. Mrs. Hutchings then bought a ouija board and took it to Mrs. Curran's house with the idea of continuing the communications. Pearl was somewhat indifferent and had to be coaxed to participate at the board. On June 22, 1913 a communication from"Pat-C" began to come through. Then on July 8, 1913 the board seemed to be possessed with unusual strength and supposed communications from Patience Worth began. "Many moons ago I lived. Again I come. Patience Worth my name. Wait, I would speak with thee. If thou shalt live, then so shall I. I make my bread at thy hearth. Good friends, let us be merrie. The time for work is past. Let the tabby drowse and blink her wisdom to the firelog." When asked when she lived, the dates 1649 - 94 were given and that her home was "Across the sea." Patience was described by Mrs. Curran as"...probably about thirty years. Her hair was dark red, mahogany, her eyes brown, and large and deep, her mouth firm and set, as though repressing strong feelings. Her hair had been disarranged by her cap, and was in big , glossy, soft waves." Mrs. Curran also saw Patience "sitting on a horse, holding a bundle tied in sail-cloth, tied with thongs and wearing a coarse cloth cape, brown-gray, with hood like a cowl, peaked. The face is in shadow. She is small and her feet are small---with coarse square-toed shoes and gray woolen stockings." After a long voyage the ship arrives at the jagged coast of America where they could find no landing place for the ship. Several flat boats were launched and Mrs. Curran saw Patience standing in the prow of her boat and one of the first to reach the shore. Patience Worth was later to indicate that she was eventually killed by the Indians. Once this mental connection was established, according to Curran, Worth began dictating poems, plays, and entire novels, sometimes switching back and forth between works. One of these works, Telka, was in an early medieval English dialect that most people believe Curran could not have known. Curran was open about the source of her writings, many of which were published to great profit and acclaim. Because of this notoriety, skeptics accused Curran of making up Patience Worth in order to gain fame and make money. No authenticated documentation has ever been found to indicate that someone named Patience Worth had lived in Dorsetshire England during the later 17th century nor are there any ship logs from that period with the name Patience Worth. The name Patience Worth does occur in census data of early settlers of the United States but none of them has been linked to the Patience Worth of Pearl Curran. In 1924, however, an investigator with the Society for Psychical Research, Walter F. Prince, concluded that the messages were coming from Curran’s subconscious, though he was unwilling to say whether the messages originated in her subconscious or were passing through it from some place of spirits.